The average cost of attending a prom is well over $900 when you factor in tickets, dinner, attire, make-up, hair, photography, and transportation. Ouch! 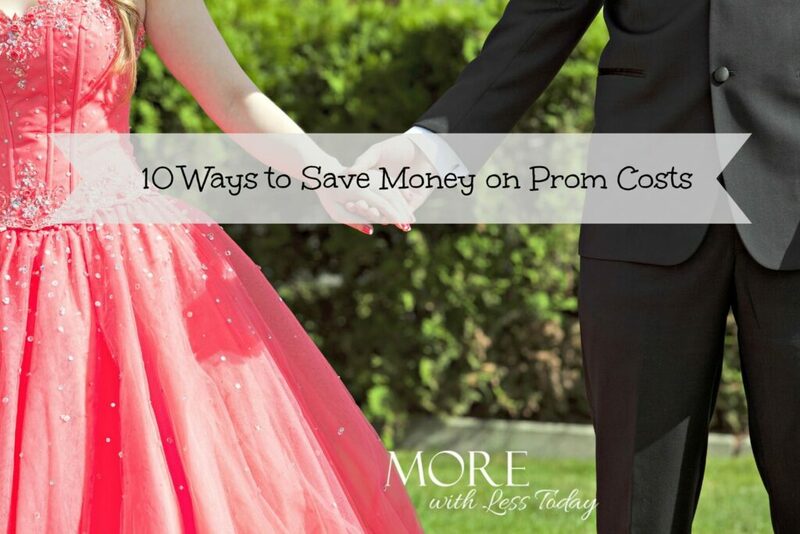 With so many other big expenses right around the corner, it’s worth taking some extra time to try and save money on prom costs. At the end of the day, it’s just a dance and you don’t have to spend like a rock star to make a memory and have a fun prom! Limit the hours of the limo rental. Just book it to ride to the prom and arrange to be picked up at the end. Instead of going out to a pricey dinner, ask one person to host a potluck dinner. Have all your friend use one florist and ask for a discount, skip the flowers altogether, or buy in bulk and make your own simple flower bouquets and boutonnieres. You can watch a video on You Tube and get a group together to fashion your own flowers. Guys – buy a used tux if you can get several uses out of it, or wear a nice suit and dress it up with a vest. If you are going to rent a tux, get a bunch of guys together and ask for a group discount. Have a formal dress swap party and include shoes, wraps and purses. Swap dresses with your friends or borrow from older friends who have formals just hanging in their closets. Girls – buy your dress at a consignment store. Choose one that you can wear again – this may require choosing a more conservative style. Take a look at renting your dress from Rent the Runway. I have heard great success stories from readers who have used the site. Have your make-up done at the mall, book an appointment at Nordstrom, Sephora or Ulta. Ask if there is a minimum purchase requirement. Ask a friend or mom to style your hair. Find a picture of a style that you like online and copy it. Ask a friend with photo skills to take photos before the event. Use a promo code and order a discounted photo book from Snapfish or Shutterfly to commemorate your evening instead of purchasing an expensive photo package. If you are looking in consignment stores and thrift stores, remember that in addition to the prom, you will need special clothing for baccalaureate and awards dinners, personal interviews for college admissions and summer job interviews or internships. I would love to update this post with your ideas to help save money on prom costs. Be sure and send me an email or leave a comment!